“It’s one of Newman’s letters,” he answered, “one wherein he writes that he holds no hatred for Kingsley.” Then he flashed a conspiratorial smile I have since come to know well. “I was at the Oratory in Birmingham. I put my hands on everything!” he laughed. Arnold came to America – twice! Visiting these sites, photographing them as they currently appear and finding archival images of the sites as Arnold would have seen them, elicits several feelings in me. At some places Arnold becomes more human for me, as when I saw the guest room and bed at the Emerson House in which Arnold must have stayed when he lectured in Concord, MA. The bed and a bell-pull were there, and I looked out of the same window and tried to imagine the view Arnold would have had the morning he left on December 13, 1883. Other times I am overwhelmed standing where he stood, looking across grand rooms, little changed in the 130 years that have filled the space between Arnold’s presence there and mine. I could feel Arnold’s memory had not faded from some places, like at Harvard’s Sanders Theater, standing amidst the silence and polished wood of that space, knowing many of his manuscripts were housed across the Yard. In other places, though, I felt I was ushering Arnold’s memory back into a space that, although not changed much, had in the lapse of years forgotten he had been there. I felt that I was personally welcoming him back. I felt this when I stood on the stage of hushed Tremont Temple in Boston, MA, and looked out over some of the same seats that held Arnold’s audience; likewise when I stole into the Friends’ Meeting House on the campus of Swarthmore College in Pennsylvania and stood in the cozy silence, facing its mute wooden pews. 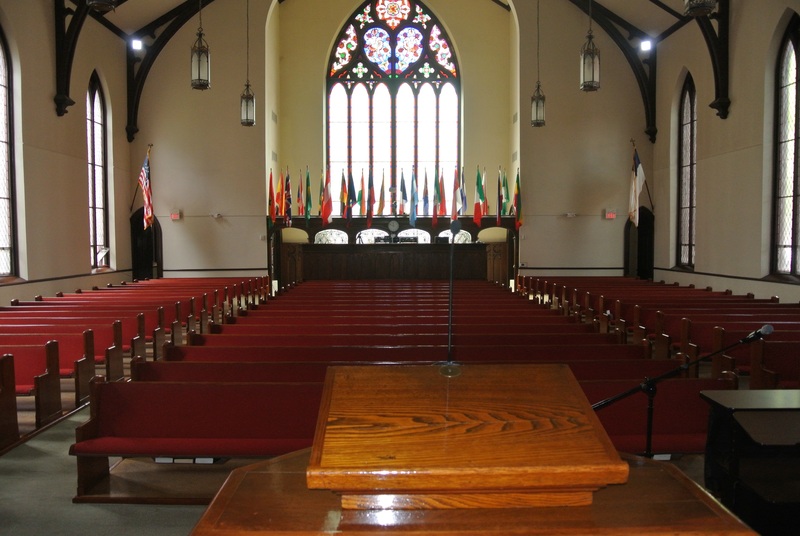 “Who was it you said spoke here?” I heard many times, such as in the sanctuary in Second Presbyterian Church, now Nassau Christian Center, in Princeton, NJ. “Matthew Arnold,” I replied, and got the feeling that the name had not been spoken there with the same significance I was bringing with it in years. The Second Presbyterian Church, Princeton, NJ, where Arnold gave a lecture entitled ‘Literature and Science’ on 11/20/1883. Another powerful feeling came when I was faced with an absence of a place. Many of the sites that were such important community centers when Arnold visited America no longer exist. I felt this resurrection of place and memory for example when, in Cambridge, MA, the Cambridge Historical Society archivist helped me locate pictures of Union Hall. Together we pored over an historic street atlas and found the exact location of this old structure; when I arrived, the location was literally an empty space but, for me at least, it was filled with significance when I visited it. But not all the spaces are victims of bulldozers & rapid change. At Wellesley College, for instance, I stood in front of a memorial constructed from the only remaining columns of College Hall, which burned in 1914. However, with the archivist Jane A. Callahan’s help, I found a photograph of the room, the Chapel, in which Arnold gave a lecture to an enthusiastic audience of young women. The juxtaposition of these two pictures helped make Arnold’s lecture there in a structure that no longer exists, a bit more tangible. Throughout all these trips – and there are so many more to take – I keep in mind Arnold’s poem “The Scholar-Gypsy,” but my feelings are opposite that of Arnold’s speaker. Unlike his speaker who urges the Oxford-truant-turned-gypsy figure to “fly our feverish contact,” I want to make contact, and I feel that mapping technology, photography, and archival studies are some of the many “heaven-sent moments for this skill” of finding intersections with the Victorians (50). So I look forward to tailing my Scholar-Gypsy through North America on my website www.arnoldian.com. And when I catch those glimpses, when I find him in those shy retreats, I will – photographically, if not physically – put my hands on everything!